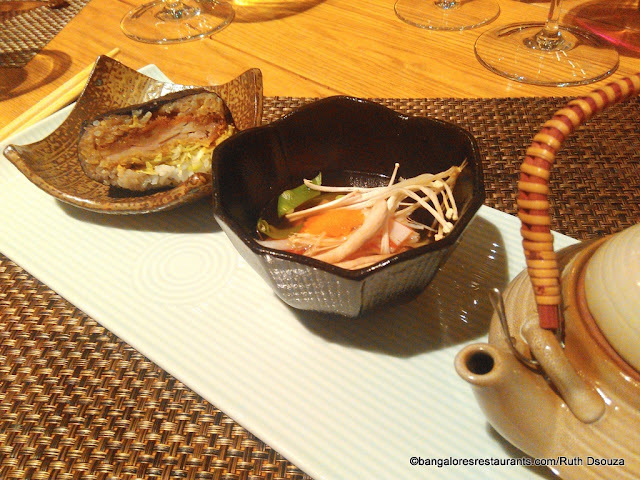 In Bangalore, the quest for quality Japanese begins and ends at the doors of Edo, at the ITC Gardenia. With produce being routinely brought in from the markets of Japan and meeting the skills of Chef Kamlesh and his team, little wonder that Edo has remained a name that always places first in Japanese food lovers lists in the city. We had the pleasure of being Suresh Hinduja's guests recently when he curated a Kaiseki meal at Edo, as part of Dine Out Experiences. The evening began with socializing over cocktails and with great anticipation the group of around 30 made their way to the tables set up elegantly for the evening. We had the pleasure of Ila and Vinod Naidu's company at our table and had ourselves a wonderful evening. The meal was paired with wines from Jacob's Creek. Now a Kaiseki meal is a multi-course affair where your chef plans out every aspect of the menu. 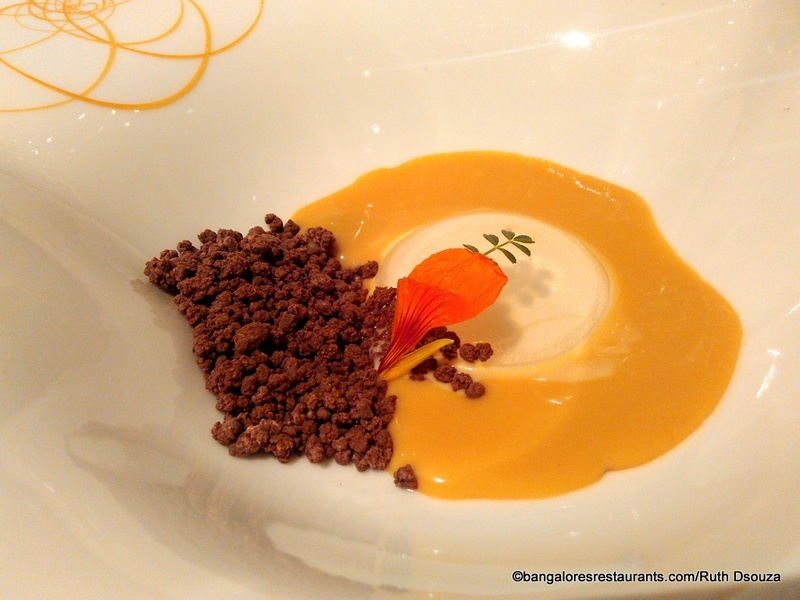 Originally meant to be a simple vegetarian meal, it has grown to be an elaborate affair with multiple courses, each one designed to be a visual treat, as well as a sensory one. While there is a traditional line up of courses, each chef usually takes liberties to highlight fresh and seasonal produce. Here is a look at what Suresh and Chef Kamlesh brought out for us. 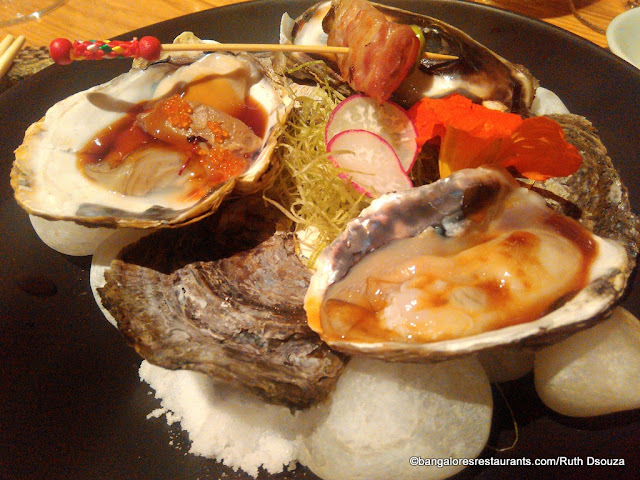 Titled the Zen of Balance, the meal began with the Zensai course of Kaki (Oyster) served three ways. On a platter came out two oyster shells, delicately balanced on a bed of white stone and salt. One was Oyster with Tamari Teriyaki and Tobiko, the second was fresh Oyster in a base of Yuzu and Soy butter; Another, an absolute delicacy was the Monk Fish Liver or what is also known as the Foie Gras of Japan. And on the skewer was the Oyster enveloped in Sakura wood smoked black pork. Each of these renditions emphasized on the freshness of the oysters and showed how a simple change in ingredients can create a dish so uniquely different from the other, despite the core being the same. 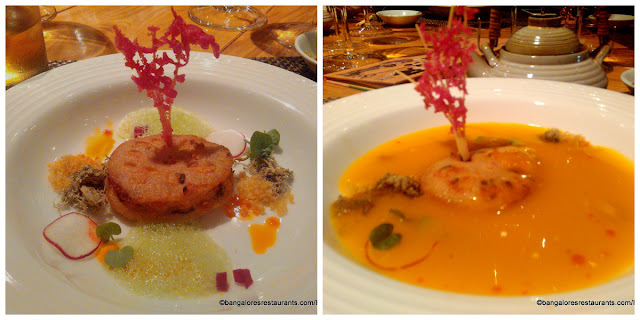 The visual pleaser that the dish was, was just Chef Kamlesh warming up. 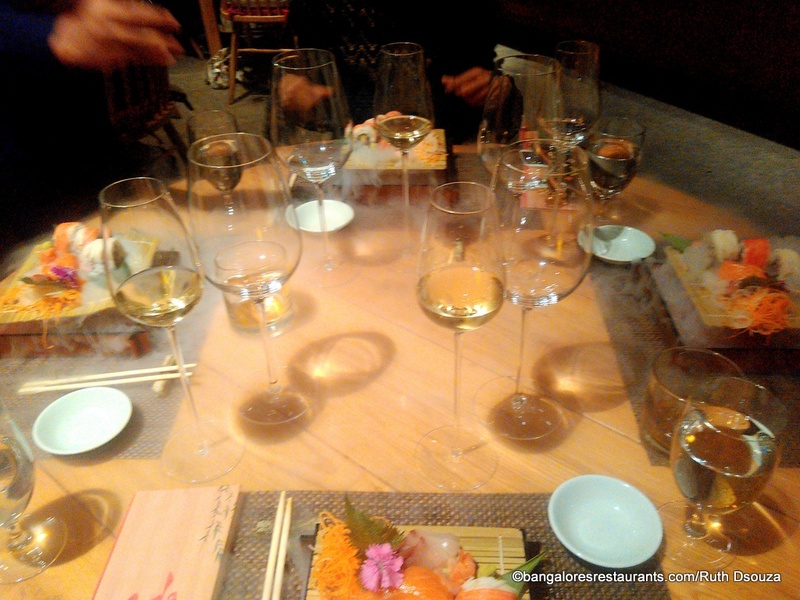 The next course was that of the Sashimi and Sushi, traditionally never the first course in a Kaiseki meal. The Sushi was of Kanpache (Young Yellow Tail) and Shake (Salmon). Edo has a rigorous supply chain to ensure their imports are as close to sea fresh as possible and that was very evident in these cuts of sashimi. The sushi was the Edo Uramaki. 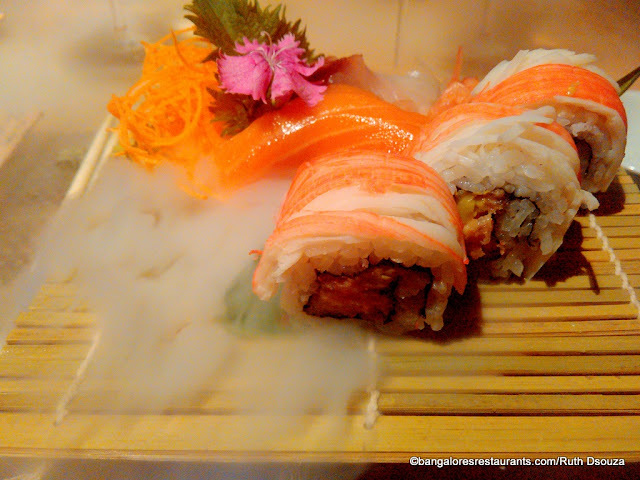 What made this platter all the more dramatic was the dry ice bed that the tatami mat was placed on. Quite the flourish! In fact, I tried to get an image of our smoking table and that's what you see below. Next up was the Kabocha Shiro - Japanese Pumpkin soup with Sake and Mirin that is poured onto a pretty plate with a lotus flower fritter over a Prawn mochi. Sakura flower also accompanied the soup, along with myriad colourful ingredients in a riot of colours and textures. The soup had a lovely grainy texture to it, which when combined with the lotus stem and the prawn brought out a whole range of flavours and some great textures as well. 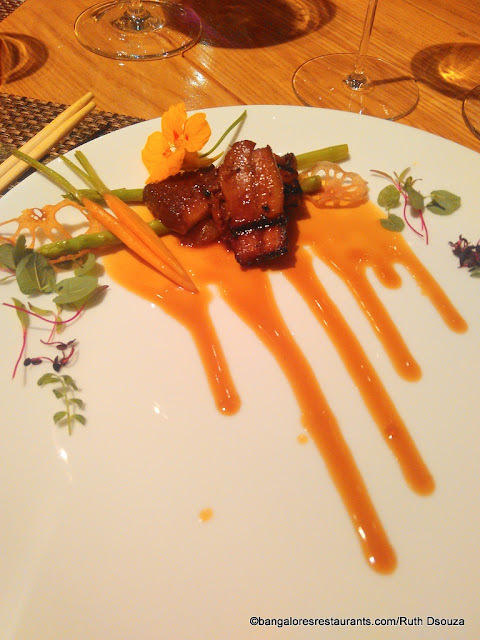 This course was followed up with Japanese Black Pork, Robata Style from the Yakimono course of the meal. This pork was specially flown in from Tokyo and boy am I glad it ended up on my plate. Called the Kurobuta Tamari Teriyaki, this grilled pork is served with a Teriyaki jus, some micro greens, delicately sliced baby carrots and lotus stem. From the Nimono - the simmered dish of this Kaiseki meal was the Suzuki Sencha Ni. Braised in Sake, Hojiso and Sencha tea is this filet of Chilean Seabass. Beautiful would be an understatement to how this dish was presented. And the experience? 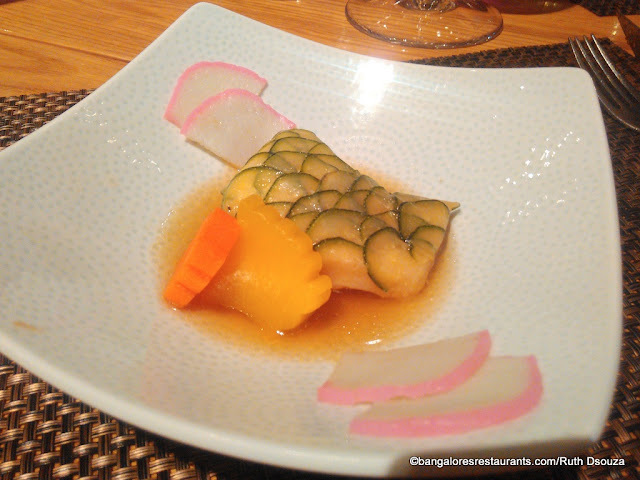 The fish retained all of its freshness and flakiness while imbibing all the taste from the braising. Its an art to get that right and the team aced it. And then perhaps what is my favourite course of the meal - The Shokuji course had the Tori Karagae Omusubi, Dobin Munshi- which when broken down is a Tori Katsu, Koshihikari rice, mustard, tonkatsu with Japanese broth. The chicken and pork cutlets ensconced in Koshihikari rice made for a package of goodness that we, quite unabashedly asked another portion of. The broth was poured over fresh veggies and made the perfect offset for the katsu. The final course, the Mizugashi was the Mizu Shingen Mochi - this was a dessert that was still in the experiment stage when we visited Edo earlier for the Obento meal. It seemed perfect to me then and it was perfect this evening too. I still can't get over the little shadow that is created in the midst of the water cake. A cracker of a dessert to end the fabulous meal on. This is one of those meals that will definitely make it to my highlights for 2017 at the end of the year... and the best part? I have the whole year to reminisce about it! Thanks to Dineout, a fabulous online restaurant reservation service and the inimitable Suresh Hinduja for curating a meal like this. Chef Kamlesh and your team, I raise my glass to you!